Home > Departments > Faculty > Olga Litvak Ph.D. 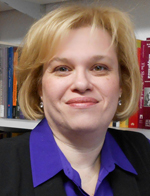 Professor Litvak specializes in Eastern European and modern Jewish history. Her first book, Conscription and the Search for Modern Russian Jewry (Indiana UP, 2006), analyzes the cultural ramifications of Russian Jewry's first experience of conscription into the Russian army. She has written and lectured on a wide range of subjects related to the study of Russian Jewry, including urban violence, literary and artistic life, war, revolution and migration. The editor of the "Painting and Sculpture" section of the landmark YIVO Encyclopedia of Jews in Eastern Europe (Yale, 2008), Prof. Litvak has also been pursuing the study of Jewish participation in the making of modern Russian visual culture. She's currently writing a book about Jewish nationalism in Russia titled "Zionism Before Herzl: The Religious Origins of Modern Jewish Political Culture," and researching a biography of Sholem-aleichem, Russia's best known Jewish writer. Professor Litvak has taught at Columbia College, the Russian State University for the Humanities in Moscow and most recently at Princeton and at SUNY Albany, where she also served as director of the Center for Jewish Studies. She offers courses in modern Jewish and Russian history, with a special emphasis on art and literature. "Emancipation Anxiety in the Jewish Fin de Siècle," The Fin de Siècle World, ed. Michael Saler (London: Routledge, Routledge, 2015), 554-567. Haskalah: The Romantic Movement in Judaism (New Brunswick: Rutgers University Press, 2012). "Found in Translation: Sholem-aleichem and the Myth of the Ideal Yiddish Reader," Translating Sholem Aleichem: History, Politics and Art, ed. Gennady Estraikh, et. al. (Oxford: Legenda Press, 2012), 6-24. "In the Evil Kingdom of Things: Sholem-aleichem and the Writing of Everyday Life in Russian-Jewish Literature," Jews in the East European Borderlands: Essays in Honor of John D. Klier, ed. Eugene M. Avrutin and Harriet Murav (Brighton, MA: Academic Studies Press, 2012), 83-105. "Khave and Her Sisters: Sholem-aleichem and the Lost Girls of 1905," Jewish Social Studies, n. s. vol. 15, no. 3 (Spring/Summer 2009): 1-38. "Rome and Jerusalem: The Figure of Jesus in the Creation of Mark Antokol’skii," The Art of Being Jewish in Modern Times, ed. Barbara Kirshenblatt-Gimblett and Jonathan Karp (Philadelphia: University of Pennsylvania Press, 2007), 441-496. Conscription and the Search for Modern Russian Jewry (Bloomington: Indiana University Press, 2006). "The Poet in Hell: H. N. Bialik and the Cultural Genealogy of the Kishinev Pogrom of 1903," Jewish Studies Quarterly, vol. 12, no. 1 (2005), 101-128.